Fall is in full swing here in Iowa and this year, the trees are giving a beautiful showing. This tree is outside my sewing room window. When I moved into this house, it was a small stick. We had to be careful to not mow over it! Last week, I did marathon quilt back making and spray basting. I have five quilt tops all ready to go. Even though I cover my floors and furniture with sheets, my floors still get sticky from the over spray. Yesterday I scrubbed and oiled my hard wood floors to make them look nice again. I need to figure out a better way to spray baste my quilts. When the weather warms up next spring, I am going to start using the garage. Until then???? Anyway! 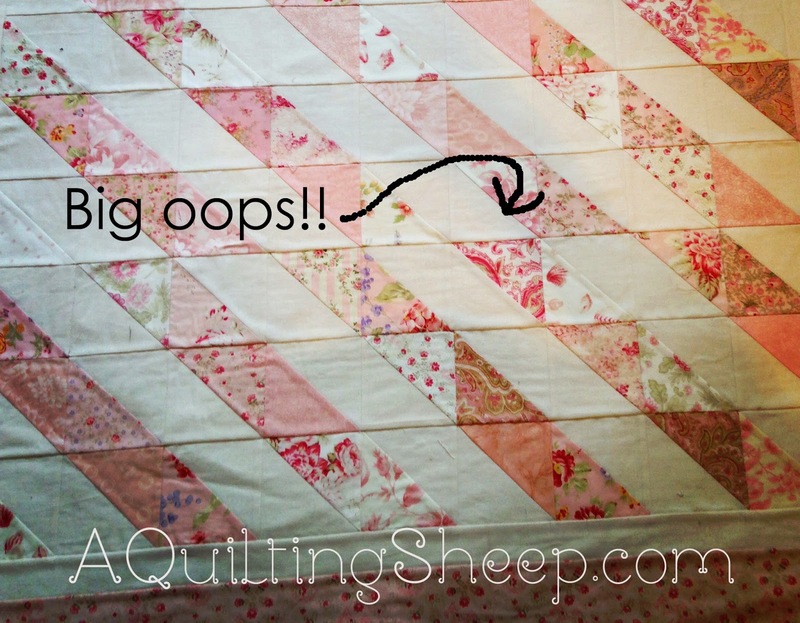 When I sat down to quilt the first of five quilts, I found this mistake!! How did I not notice it when it was sitting around for weeks and when I basted it? I don't know!! It took some work to take it apart, and fix it, especially because of the basting spray making it sticky, but I had to fix it. It was going to drive me nutty... At one point I was ready to toss the whole thing. Tell me I am not the only one who feels that way at times. Here she is all fixed and quilted up. I am very glad I didn't toss it!! I am so glad you did not toss it. I know it is frustrating when that happens. But your quilt is just gorgeous. 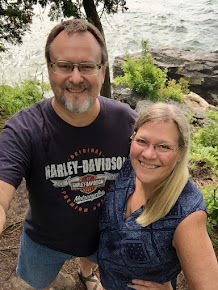 Hope you have an awesome day my dear. Yes, I know the feeling well - that deep down sinking feeling. Many a time I feel I waste more time correcting than sewing - but I'm so glad you persevered. Your quilt looks BEAUTIFUL! Love your quilting on it. What a lovely quilt! We've all been there. Glad you didn't toss it! 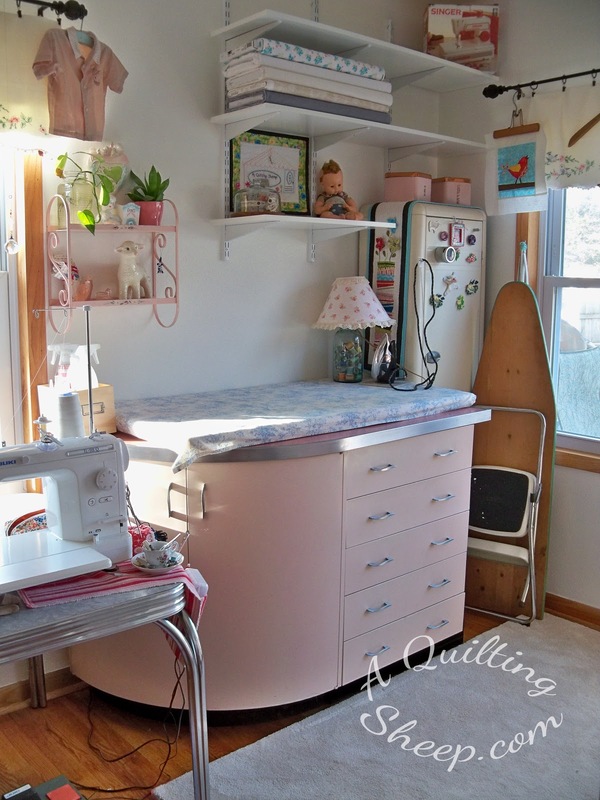 I love your view from your sewing room! 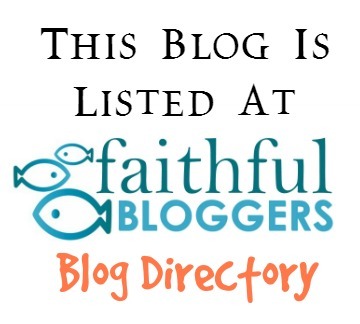 It must just refresh your soul to look out at that every day! My helpers are such great helpers. 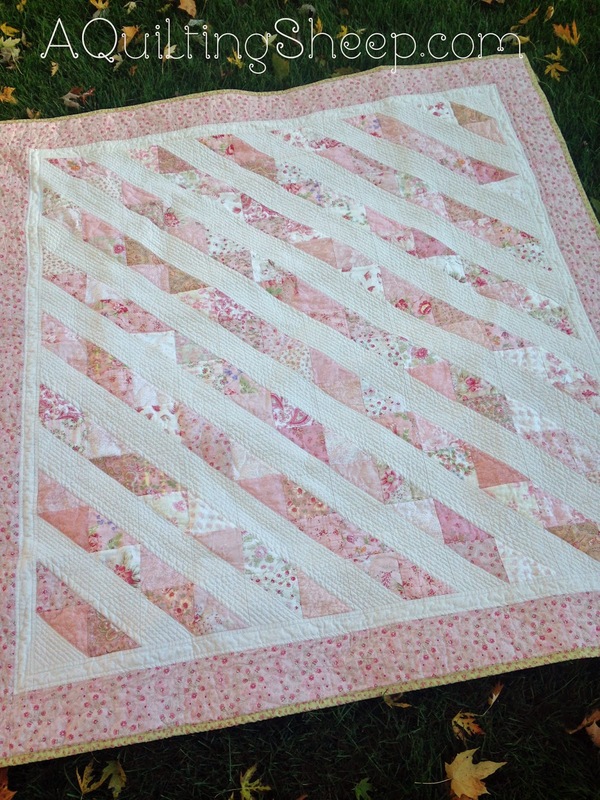 Such a pretty quilt though! Glad you fixed it! AW!!!!! very very sweetjob! worth the ripping time! and the tree....OH MY!! !.....GO FALL!!.. I laughed at your mistake :) Those mistakes are what make them handmade and not mass produced. You could have left it if you wanted and it still would have been perfect. You should see my cats after walking on the floor after I had spray basted. It looks like they are doing the hokey pokey trying to get the sticky off! LOL I LOVE your quilt! Oh your quilt is gorgeous. Yep when I have challenges. Put it away, walk away until I am ready to deal with it. I need to clean house better but the days I have something planned it doesn't work. It's beautiful! So glad you stuck with it. I need to remember that as I'm so tempted to give up on a king size patchwork quilt of 4" squares. What was I thinking? 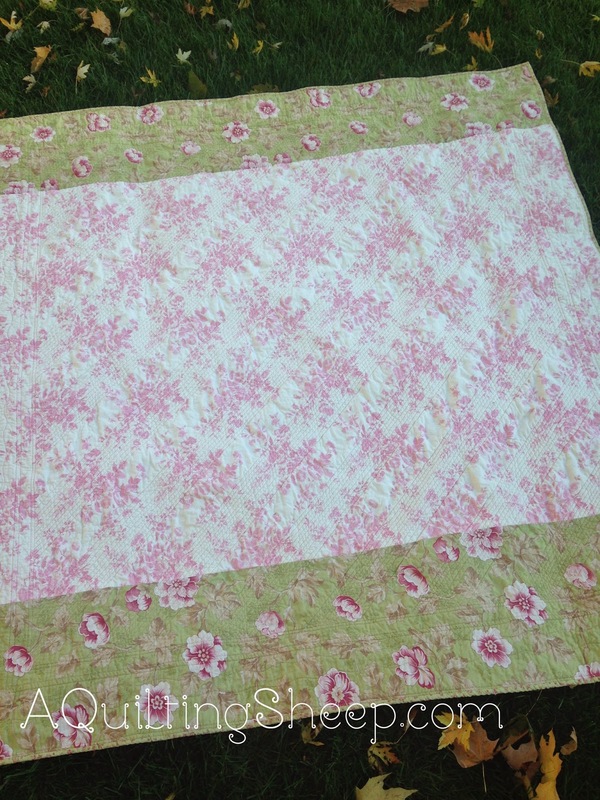 My seams don't match and I have no idea how I'm going to baste a king size quilt.....especially being a beginner. Yet I want to use and love it so I press on! Your tree is fabulous. Ours are just beginning to change colors. And it is supposed to be close to 90 degrees this weekend. I'm so ready for fall. Hi Amy, I make goof ups frequently. I just did last night, but some you can take apart and then use the mess up for another project.... right? this turned out really cute. Did you quilt this on your domestic regular sewing machine? Did you use the walking foot? I am .... well, I have a lot of projects, and nothing is quilted. I need you to move next door please. Your little quilt looks darling! I need to do some fall cleaning up over here, but I'm so far behind on everything I need to get sewn for the Holidays, it will probably be a New Years Clean Sweep! The quilt is beautiful. I love the colors and the pattern. I agree, I am glad you didn't toss it. Some days it seems as though my best friend is Seam Ripper! Sometimes I will take a picture and find my mistake in a picture.. 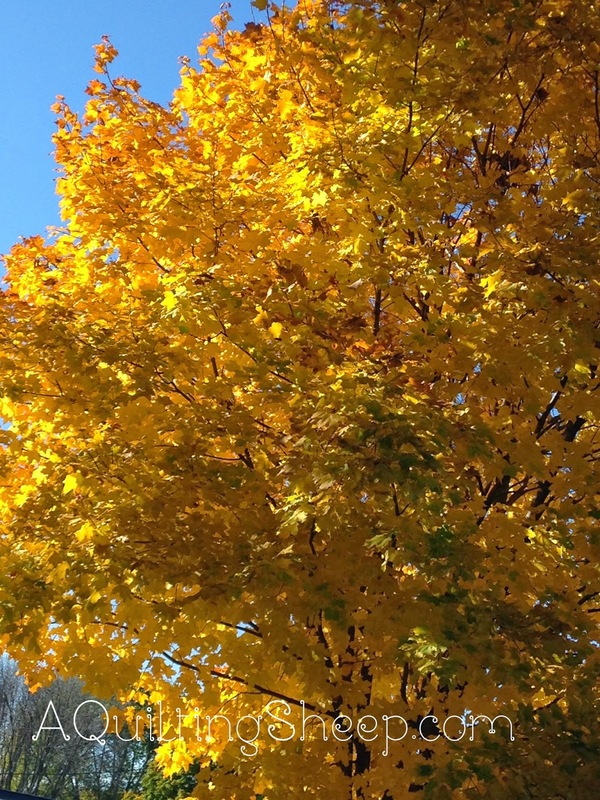 Your fall tree is beautiful. Our leaves have fallen the past few days. Your tree is soooo gorgeous!!! Your quilt turned out wonderfully!! I wonder if cheap painting drop sheets from a hardware store would work for laying on your floor when you spray baste. I like the way you quilting it. When I use the spray basting I go in my garage. Instead of laying the quilt on the garage floor I tape the backing an empty wall, spray, add the batting, spray and add the top. Now if I was doing a queen or king size quilt I would have to figure out another way to do it but for smaller quilts it works quite well.